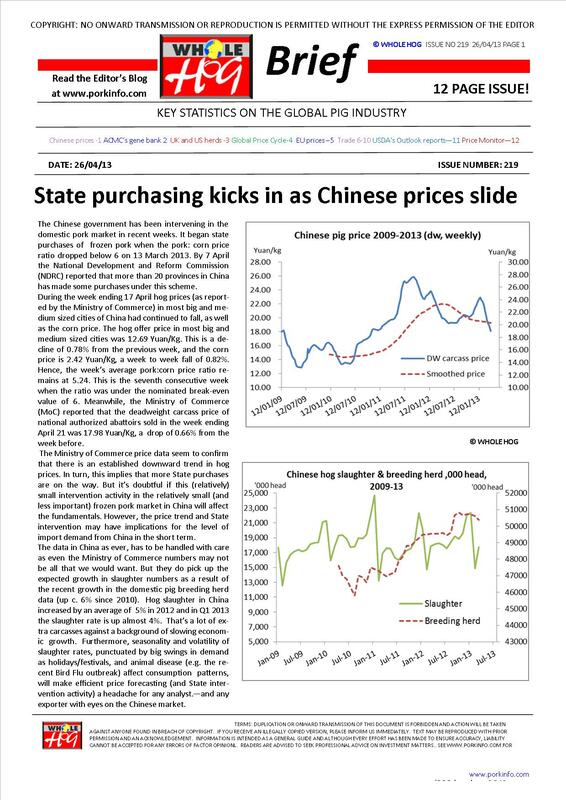 The front page of the April 2013 issue reports on the slide in Chinese pig prices and the latest Chinese State purchases data. 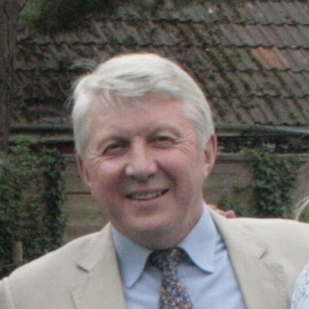 Page 2 presents a review of ACMC – the UK pig genetics company. On page 3 we review the gamble that English producers seem to be taking on herd expansion and the signs that US producers are not cutting back on herd expansion. Page 4’s analysis of the Global Pig Price Index reports a plateau in the global pig price index and wonders if Bird Flu in China might be behind this. Europe’s pig prices hang on for another month on page 5. Weaker export sales almost everywhere for Canadian exporters on page 6 and on page 7 the USA’s pork export sales in February 2013 are dire. The Danes continue to make headway in the Australian market as described on page 8. No big bang in Korea to report on page 9 whilst South Korea’s pigmeat imports return to trend. On the same page Vietnamese and Thai pig prices are also compared. On page 10 Japan’s imports are described as going into reverse although some exporters are making progress there. On page 11 the USDA’s latest Outlook reports are dissected and its revised production and trade forecasts and explanations of the drivers for the US hog and pork industry are set out. 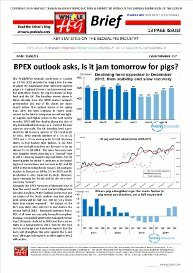 The back page sets out the Short View on pig prices and pig prices for 18 countries are presented in the Global Price Monitor, and the chart of the week.